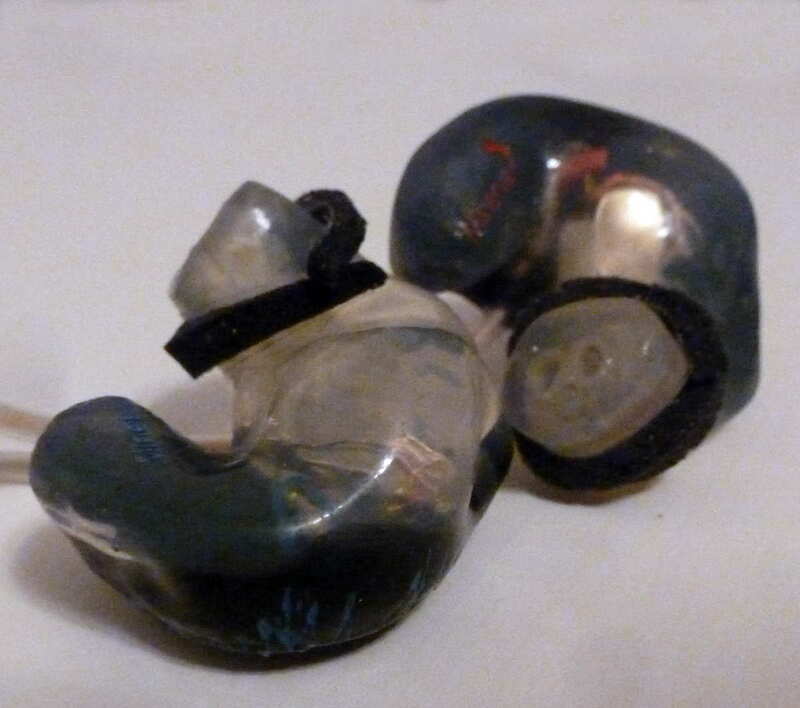 You just received your custom in-ear monitors (CIEMs) and put them in; ouch, they just don’t feel right. Or they don’t seem to isolate like you thought they should. A sinking feeling goes through you as thoughts of sending your brand new custom back for a refit fill your mind. Do you really need a refit, or will you get used to the fit? This custom in-ear monitors fit guide will help you with a better understanding of what makes a good fit. For first time CIEM owners, figuring out proper insertion technique is important. There are different techniques for inserting and removing acrylic and silicone shells, and finishes differ by manufacturer. Some manufacturers use a slick coating that acts like a lubricant while others don’t, resulting in difficulty for initial insertions. My first experience with most CIEMs has been that they are dry and difficult to insert, can hurt, and may not seal well. But, that doesn’t mean they aren’t actually sized just right! Using an ear lubricant the first 5-10 insertions will help alleviate the dryness and form a coating on the CIEM which will improve both fit and seal, sometimes dramatically. There are plenty of aftermarket lubricants available, or Vaseline or even saliva can add lubrication and alleviate fit issues. When applying lubricant, make sure you don’t get any lubricant into the sound tubes or you can block the tube and affect the sound. Over time, your cerumen (ear wax) will lubricate the shell and make insertion easier. Cleaning the shell with an alcohol wipe will remove most if not all of the lubricant, so be prepared to apply more if necessary. Using a hearing aid dryer for cleaning works well and won’t remove the lubricant. 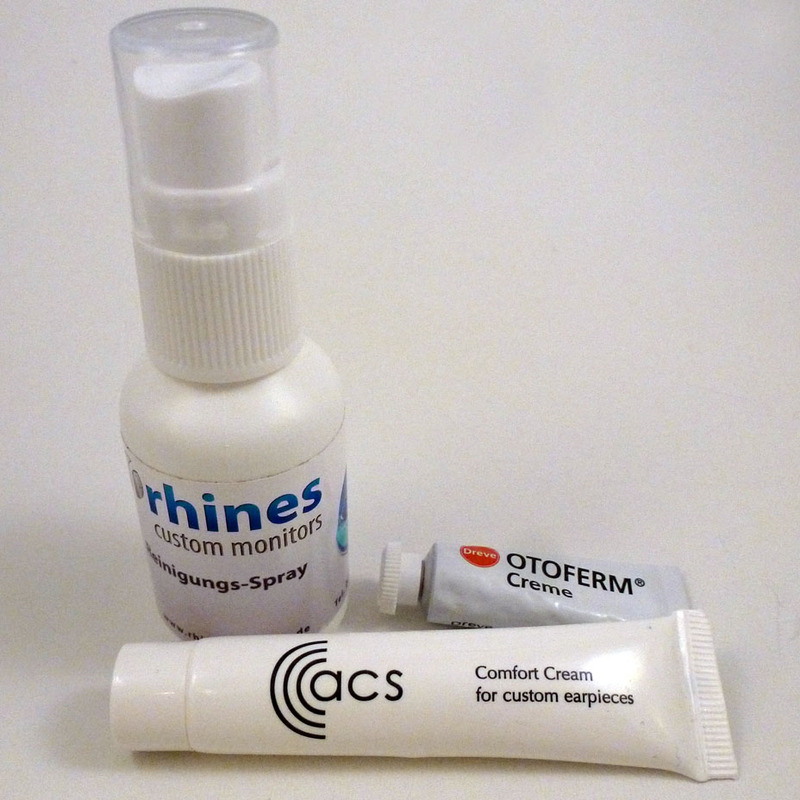 There is a technique for insertion and removal of CIEMs, and acrylic and silicone shells should be handled a bit differently. The hard acrylic shell makes it easy and safe to use a twist in and twist out motion. The canal portion of the shell should be behind your ear canal, closer to the back of your head. Once the canal portion of the shell is inserted into the ear, rotate the canal portion up to fit into place. With acrylic shells, I usually use the cable for assistance in the twisting. Removal is similar, but the opposite rotation direction. Pulling the CIEM out without the twist shouldn’t be possible, or if it is, it will most likely be painful. I do admit I usually start twisting the shells out by pushing on the top of the shell connector of the cable. 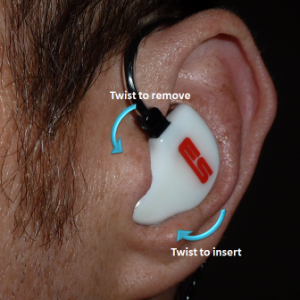 Insertion and removal takes half a second and is much quicker than inserting/removing a universal IEM. For silicone, the twist is still there, but I found a push during twisting helps seat the CIEM in my ear properly. Silicone shells are softer and will bend during insertion, and I don’t want to put pressure on the cable during insertion or removal, while I use the cable connector to assist in acrylic shell insertion and removal. Removal is just a twist, but make sure to grab the shell and not the cable. How do you know if you have a good fit: seal, comfort, and sound. Seal: Just like the seal of a jar, door, or anything else, the CIEM shell should prevent the passing of air between your ear canal and the outside. Anatomy plays a role here, as everyone is different. Most people with a good fit can chew without breaking the seal, and laying down vs. sitting up can also affect the seal. But again, these factors are anatomy dependent. Sometimes CIEMs seal so well the seal needs to be temporarily broken just after insertion by a slight push or twist of the shell, removing pressure developed during insertion. If you have a vacuum when you insert the CIEM, you know the seal is good. If you can break the seal when chewing gum, you could probably use a bit tighter fit. Comfort: While the sound is very dependent on the fit, in my experience, comfort also affects the sound. If a CIEMs is too tight it will hurt after some time. In my experience, there can be discomfort and then there can be pain. Discomfort goes away after a few days and doesn’t return as my ears adjust to the new CIEM while pain continuously occurs and often gets worse. I have been known to shave acrylic shells down with a bench polisher to alleviate pain, but I don’t recommend it as it may (will) void the warranty. Contact the manufacturer and let them know. There are typically three areas that can cause issues: the canal, the upper concha area, and the base of the canal. More information can be found below. Sound: CIEMs offer a good amount of isolation, and you should experience a relatively significant amount of isolation when the CIEM is inserted. If you are used to IEMs, in most cases you can expect a greater amount of isolation. This is dependent on what IEMs you use and your anatomy, as well as your surrounding and focus. For example, I can listen for sounds with my CEIMs in and hear them, but when I am working, I hear nothing! Essentially, it should sound like something is blocking your ears. A perfect fit can often be achieved by making a great impression, but there are time when even a great impression doesn’t result in a perfect fit, with some minor fit issues. And, another thing to take into consideration is that your ear canal sizes can change depending on several factors, with the most common ones being weight change (and water retention/dehydration), being sick, such as having a head cold, and irritation. 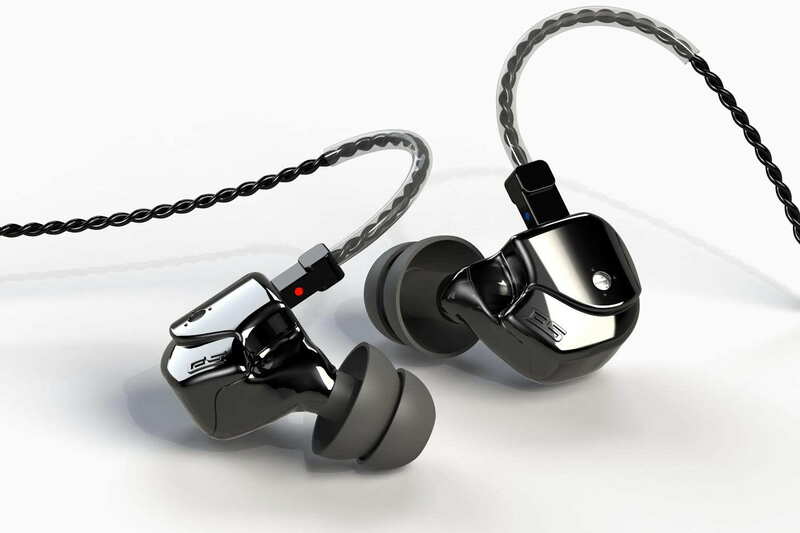 Typically there is a set time for sending a CIEM back for a refit, so it is important to address any issues as quickly as possible. If you have any obvious severe fit issues, you should contact the manufacturer after trying a few steps listed below. If you have minor fit issues, your ears may or may not adjust to the new shell. 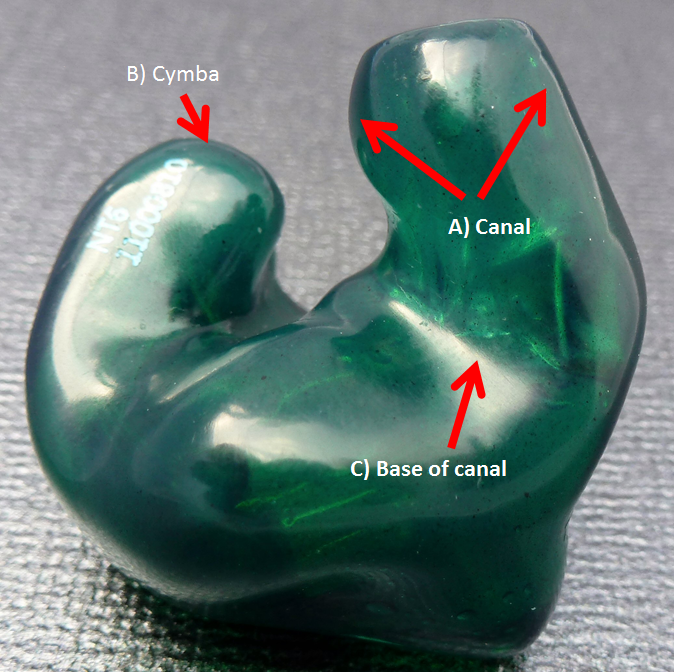 Common fit issues include the canals being too large, small, long, or short, the upper concha area not fitting right, or a poor sound tube angle. Let’s look at some of the fit issues and how you can deal with them. Canal too large: This can cause either pain or discomfort ranging from immediately to after a good deal of time such as an hour. If it hurts right away, chances are you will need a refit. If it hurts after some time, your ears may adjust and the pain. Discomfort is something that will go away for many people, but not always. Canal too long: This will feel like there is something poking the inside of your ear that shouldn’t be poking, or could even prevent the shell from seating properly inside your ears. Canal too small/short: This will lead to a lack of bass and possibly tonal issues. An easy way to check is to push the shells in your ears deeper with the palms of your hands while turning shells a bit to constrict the size of your ear canal. If the sound improves and you hear more bass, the canal is too small. Canal not at the right angle: If the sound tubes are not at the correct angle, this will affect the sound ranging from a bit to a lot. A tell tail sign of this is the sound is muffled or lacks a part of the frequency spectrum in one or both ears. To check for this, look up and down and move the shell around in your ear to see if the sound gets better. Try to identify when they sound best and contact the manufacturer. If you can get another set of deep impressions, you may be able to see where the issue is located. The more you can communicate to the manufacturer, the better their ability to fix the issue. Cymba area sore: In my experience, this doesn’t go away over time and the area needs to be shaved down, which generally requires the CIEM to be sent back. It is possible to fix minor issues by using sandpaper. If the base of the canal isn’t properly aligned with the angle of the canal, the fit will suffer as one part of the shell will either not sit at the correct angle, causing pain, or the canal will not create a proper seal. Sound tube angle: sometimes the sound tube angle is oriented at a weird angle, or it doesn’t fit the natural curve of your ear canal. This can lead to sound issues and possible issues when inserting/removing a CIEM. When fit properly, Custom IEMs offer extreme comfort and exceptional sound. When they don’t fit properly, the sound and comfort suffer, and the chances of you using and enjoying them decreases. 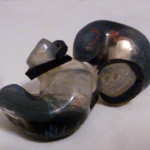 If there are issues with your CIEM, get them fixed ASAP as the short term hassle will be worth the long term benefits. CIEMs usually have a refit period that typically ranges from 30 to 90 days, and if you have fit issues within this time, it is recommended to work with the manufacturer for a free refit. If you have had your CIEMs for quite a while and have issues due to the canals being too small or losing a seal during movement/singing, look into Comply Custom Wraps. If your CIEMs were manufactured in another country, or if you are a hands on type of person, you have options to fix a poor fit. You can find a local audiologist/lab to make the adjustments for you or you can fix them yourself. There are some audiologists that can fix your issues in their office, but many will require the work to be done in a lab, and often it is difficult to find a local lab or get the lab to work directly with you. Audiologists should have experience fixing fit issues with hearing aids, so a similar procedure should occur, but there are differences between a hearing aid and a CIEM. It is best to work directly with the person doing the work and be cognizant of their experience level and what they plan on doing before they do it. Your best bet is to communicate with the CIEM manufacturer to ensure they will still do a refit if the local audiologist isn’t able to fix your issues first. If you are a hands-on person, you can get high grit sand paper, a bench grinder, and some plastic polish to reduce areas that are too tight and get a better fit. I have used this method, and while the fit became perfect (and the sound improved), the finish wasn’t quite as good as the original if examined closely. If the shell is too small, it is possible to build it up with clear acrylic nail polish. I recommend organic nail polish as the regular nail polish I initially used irritated my ears. Make sure to clean the shell well before applying nail polish and apply many thin coats, making sure the nail polish dries completely between applications. This is a time consuming process, but if you can get a better fit and save the time and money of shipping a CIEM back, it may just be worth it. Another method is Blu Tack, which can be used to fix large discrepancies. To learn more about what makes a good and bad ear impression, read Ear self-impressions for custom in-ear monitors – what you need to know. I ordered a pair of JH Audio Lola CIEMS and hope everyone here resolved their issues. Mine have been sent back for the second time now with issues in the left canal if I lie down (muffled treble), poor seal on the right ear canal the first time, as well as cable entry issues where it doesn’t sit in the natural gap in my ear to go up and around. Has anyone had to settle for finnicky earphones? I’m worried since the cable issue was “fixed” by tilting it out and forward more, which makes the leverage such that it’s easier to unseal when the cable goes behind my head. Not ideal. It also worry that the issue with treble dampening in the left ear hasn’t been acknowledged and they perhaps I’ll be told that they must be used in an upright position… Yet my $50 Etymotic earphones don’t have the issue that the $1750 Lola does. Also: has anyone ever had the audiologist do an impression where they partway trace the path the cable and connector should take to avoid any issue with that? Maybe it’s just the larger 4-pin connector Jerry Harvey Audio uses, which I love since it allows adjustable bass and is very sturdy… Just not as common and maybe a slimmer two pin connector wouldn’t have the same fit issues. Did you ever get the Lola fit to your liking? I’m on my 4th return, with 2nd impression done for my right ear. Unfortunately, they don’t have a digital copy of the impression so having the original impression available to assess is a non-starter. I suspect in my case the sound hole is pointing in the wrong direction as my right ear isn’t as neatly formed as the left. Hi, I just got my CIEMs after two refits on the Left one. funny enough, while the left one was hurting, the right one always seemed perfect. Now the they fixed the Left, I’m starting to feel discomfort on the right, which is strange because it wasn’t there before. Should I also get a refit on the right one now? it’s only been about 3 weeks of the back on forth with the refits, I don’t think my ears would change that much? I don’t know if anyone’s watching this thread, but I could use some advice. I recently purchased my first pair of CIEMs, but I’m having a hard time getting the right fit. I’ve had several refits already, but it seems like they’re still not quite right. On the latest version, the left monitor feels too big: the muscle in the left side of my jaw is sore when I’m wearing the monitor, and it stays sore for a while afterwards. And the right monitor feels too small: compared to the left, it doesn’t fill my ear canal to the same degree, and it lets in a lot more ambient noise. Since it’s expensive to go back and forth for refits, I’d be grateful to know whether this sounds normal or whether (as I suspect) I need to go back to them again to get it right. It sounds as though you you had a bad set of ear impressions. If that is the case I’m not sure that you will be able to fix your existing monitors. You may have to buy a new pair. If you do though, make sure that when you get the impressions done they feel right – they should totally block out outside noise and feel as though they’re filling your entire ear canals. It’s hard to know though unless you’ve experienced a poor impression being done and a good one. So I think I have a good fit with my customs but I want to make sure. If I pull down on my earlobes with my customs in my ear, I get a kind of treble lift and possibly greater soundstage. Is this normal or does this sound like an issue? Thanks for the info as always. Is the treble lift due to a lowering of the bass level (breaking the seal), or just a better overall sound? The comment of “possibly greater soundstage” indicates the bass isn’t reduced, as warmth usually contributes to soundstage. Also, I am not sure the magnitude of the changes, and if the change is really a good thing. Many factors go into the sound, but if there is an issue, it seems like it may be the angle of the sound tubes. Do any other adjustments while in-ear result in the same change? What CIEM do you have? I did some more tests with my Custom Art Music Two’s. While the treble lift adds a little more clarity and sparkle, the bass is lowered, even though I am not breaking the seal. My assumption is that the sound tubes might have a slightly shallower fit when I pull on my ear lobes giving the sensation of a higher treble but at the cost of the bass frequencies and “rumble” being less. I can produce the same effect when I push down on top of my custom while they are in my ear. However, I should mention that with either test, it does require force and pressure and I cannot recreate the sound just by turning my head or chewing gum for instance. Does this seem to be a fair analysis with a shallower fit? Thank you for the insight. Yes that sounds like a fair assessment and in line with a shallower vs. deeper fit, but also a bit of a lost seal when adjusting. How much improved is the sound, i.e. is it worth sending them back for a refit? If so, I would contact Piotr and let him know of the issue as you described it and work with him on a resolution. He is a great guy! Thanks for your response. I think it just changes the sounds signature to a brighter more V shape sound. The brighter sound makes it more fun with possibly more clarity in the highs but there is definitely a lost of texture and possibly detail in the lower mids. I am not sure if it is a better sound at this point. I’m thinking of using blue tack as a means to confirm loose areas in the canal rather than a second re-fit, as the tolerance is really quite high and I’m picky. Your site has expired link for organic nail polish. Not being an expert on nail polish, looking for some guidance on what has worked without irritation. Can you name a brand… and I’m in Canada so looking for something that would be found on the shelf here. Hi NightFlight, let us know how the blu tack works for you. Any good organic nail polish should suffice, and I randomly picked the lowest cost with good rating product from Amazon. I just received my first CIEM, the 64 Audio V6-S , the left shell is absolutely perfect, whereas the right feels a bit uncomfortable near or around the concha, also it sounds muffled when fully inserted and there’s alot of pressure, should i get a refit immediately or have them for a few days? Hi Chris, congratulations on getting your first CIEM, but sorry to hear about your issue. Chances are you will need a refit of the right, but you can try the following first. Look and see if there are differences that could result in a sound difference, such as a bent sound tube, debris in the sound tube, or very different sound tube exit angle (although people can have significantly different left and right ear canal shapes). If everything looks OK, try using a lubricant if you haven’t already. Since you have one good shell and one bad, and it is easy to hear the difference, can you adjust the right shell while in your ear to sound similar to the left? If not you should contact them right away. If so, it is a matter of how much you have to adjust as a little may be overcome, but a large adjustment will require a refit. Also, just to be sure, have you had your ears checked for wax buildup? People have different types of cerumen (ear wax) and the CIEM performance can be affected by it or push it in your ears. Let me know if you have any other questions and I hope you are enjoying both channels soon! if i push on my tragus the right sounds like the left, pressure goes away, clears up sound, but bass suffers abit, everything else looked ok.
How much do you have to push? Can you push it into place and have the clear sound stay? How different is the bass? I would suggest wearing them as much as you can over the next few days and see if anything improves with the fit. If it isn’t perfect, send em back as I know when I don’t, I regret it later. i can either push it to the side where the shell rests or down, doesn’t take much force and i can get it to stay, but bass response is definitely stronger/more noticeable in the left. I would contact 1964 and let them know. You can give it several days before you send it back to see if it improves, and they may have some other advise. Thanks for this article, it was exactly what I was looking for. Having recently received my first pair of custom IEMs I was disappointed at the lack of isolation. These are for use on a motorcycle, not live stage so the requirement for me to at least have sufficient isolation for hearing protection is important. The parts about the fit were particularly helpful having identified a potential issue with my fit. After two weeks use I’m already questioning if they’re worth the hassle over the universal foam tip that originally came with the drivers (Shure SE215s). I’ve since made an appointment with my audiologist though to have the issues seen to having time left on my refit window. Having said all that, I’m wondering if you could give some insight into the different compounds available for CIEMs. Mine are a silicone, offer little to no attenuation. Apologies for dragging out an old article, but the information is as relevant today as it was in 2013. Thanks for the question. An article like this should be timeless as the technology and potential issues haven’t changed. Is your setup a silicone tip for the SE215, or a full custom? Either way, you should be getting [much better] isolation, especially since they are silicone. Have you tried using a lubricant to ensure the CIEM is inserted properly? If they don’t go in all the way, then they won’t attenuate sound. Also, a lot depends on the ear impression the CIEM was made from. The attenuation you hear when getting ear impressions should be close to what you get with silicone CIEMs. I say close because an ear impression will isolate more than a CIEM as the CIEM has drivers and sound tubes vs. a larger solid body of silicone, and the impression typically fits tighter. While I am not recommending self-impressions, reading my article on self-impressions will further educate you on what is important with an impression. As far as material, with all things equal, silicone isolates better than acrylic in my experience. You should have better isolation from your CIEM than a foam ear tip will give you. Keep us informed on what your audiologist says, which is the right move. Let me know if you have any other questions. I have a new pair of 64Audio A6 and now after 5th day finally can insert and remove them without discomfort. Strangely, though, I find sound quality is good but deteriorates when I lean back and greatly improved when I lean forward….latter is bliss but tough on the back. Hoping I don’t need a re-fit as they do feel snug but finally are comfortable. Perhaps if I try the lube as you suggest may it make the fit and seal more impervious to body and head position? Any advise for this CIEM newbie would be appreciated! I have experienced the same issue you have when leaning back with a set of CIEMs. It is from the way your ears change as your head position changes. There are a few steps in resolving the issue. I would explain the situation to the manufacturer and ask for a refit. The cause for my issue was the Cymba area (outer portion of the CIEM) was not big enough and allowed the shell to move when I leaned back. Once the size was better matched to my ear, the issue was resolved. Another way is to take another set of impressions in the leaning back position, which should help with fit, but I would work with the manufacturer first. Please let us know how this gets resolved. As an aside, at your suggestion I am now using lube for insertion and while it has not fully solved the problem I do find I can insert the A6 far easier and fit / seal seem better. Joe, quick update is that I received my A6 back from 64Audio, Refit service was quick: 10 days from RMA to receiving them back. The fit is now very comfortable and the positional sound change is far less, likely now within normal / unavoidable tolerance limits. I haven’t received a detailed explanation of what was done but the tech’s notes as read to me indicate the solution included shortening the canal length slightly so that they would not abut the ear side walls when I lay my head back, thereby obstructing the sound tubes / muffling the sound output. I am a happy camper, and hope my experience may benefit other readers of your blog. Sincere thanks for your interest and help. Hi Lory, thanks for the update and glad the issue was resolved. The issue you mentioned is another possible issue, and one that I have encountered also, but when it happened to me it wasn’t position dependent. Little things like sound tube direction can make a huge difference in CIEMs. Anyways, great to hear you are a happy camper! Hi Joe, just got my first acrylic CIEM (JH13). When I twist and push them in my ears a vacuum is achieved. Then they give just a bit, but I don’t think it’s enough to break the seal. I hear like 5% outside noise, but the bass is not reduced to my ears. Is this normal? If the sound is good and there isn’t pressure in your ears, the fit is fine. CIEMs isolate better than regular IEMs, and filling the ear can be a different experience for some. How is the treble? If you move the CIEM around a bit more, or even back it out a bit, do you get a better result? Treble is unaffected, and I’ve learnt that with time the acrylic shell gets easier to insert bcos of the extra lubrication from the ear. The fit is perfect, so to speak. Thanks for your time. Sorry for the delayed reply. Applying nail polish is for fixing smaller issues and will be difficult to apply enough to fix larger issues. If the issues is larger and you are out of your refit, you may still want to contact the manufacturer and let them know you didn’t realize they were loose and see what they say. If they are in the refit period, the best is to send them in. Something I have thought about but not done is contacting a local audiologist and see if they can help by taking another set of impressions and comparing with the shell, adding a bit of acrylic where necessary. Risky in a way since you never know if the audiologist is really good. You should find one that has their own lab, or goes to a lab themselves. Back to the original question…typically the nail polish needs to be applied on the canal. Move the CIEM around in your ear until you figure out how to press to get a good seal, and then apply in that area. Or, you can try using something like the Comply Custom Wraps to test the location of the issue. Let me know if you have any other questions and if you are able to fix the fit issue. How do you use Blutack? I meant I did used it but it doesn’t dry up and keeps changing its contact areas, everytime u put it in. Sorry for the delayed response. Blu tack will adjust, but using less is best. It is not designed to fill huge gaps, but decent sized issues, and in such usage, should work. Make sure the CIEM is clean and dry, put a relatively thin layer over the appropriate area and then it should work. Comply foam strips may be better for most applications.